Does your team have all the tools they need to communicate your brand consistently? 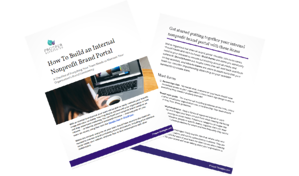 Use our checklist to build your nonprofit's internal brand portal. With an internal brand portal or intranet, your team will be able to easily maintain your brand’s image and voice, no matter how long they’ve worked with your organization or how well they understand marketing. Soon, everyone on your team will have access to the materials needed to maintain brand consistency across all channels, including print collateral, social media, your website, and even face-to-face conversations with other stakeholders. Fill out the form to download this resource and start building your organization's internal brand portal. Where can I learn more about working with Prosper Strategies? Visit us online at prosper-strategies.com and contact us here. Prosper Strategies helped us identify the attributes that make our organization truly unique, and assemble a marketing plan that effectively communicates these strengths to the public, other organizations and foundations. The messaging guides, calendars, and other materials [we created] are now central to IEC's communications strategy. We view [Prosper Strategies] as a catalyst for Rebuilding Exchange to scale our reach and increase the impact of our message. This growth directly contributes to our ability to divert over 1 million pounds of materials from the landfill each year. Nonprofit HR enjoys working with marketing professionals that listen and understand their clients' needs. Prosper Strategies is not just our marketing partner, but we consider them to be a strategic team that gets how we work. Prosper Strategies offers sound marketing counsel and guidance that is forward thinking and very much in line with how we need to approach the industry we serve. Know someone else who might find value in this? Share it.